Unemployment decreased in September as 63,000 higher people found a job, presenting it a great month for Canadian jobs. 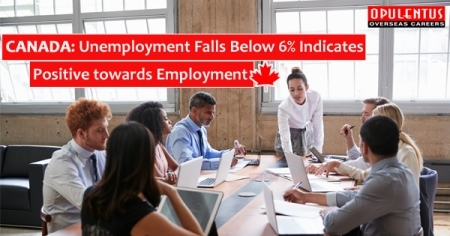 The recent Labour Force Survey from Canadian Statistics puts the unemployment rate in Canada at 5.9% at the end of the September month. In the provinces, British Columbia observed its rate of unemployment falls to 1.1 percentages points to 4.2%, with a jobs gain of 33,000. In the latest 12 months, employment in Canada has increased 222,000, or 1.2 percent, completely in full-time work. The third quarter offered an employment gain of 66,000 and comparatively smooth first and second quarters. The focus age-group of 25 to 54-year-old viewed employment increase of 54,000 in September. When coming to the Men and women numbers 34,000 and 20,000 respectively and both provided to the rise. Both groups observed 0.2 percentage unemployment decreases, to 5.1% for men and 5% for women. Construction experienced a strong in the month of September when watching at the figures by industry, totaling 28,000 jobs. Industry Employment is now up 34,000 in the latest 12 months. An improvement of 13,000 jobs was viewed in the insurance, finance, real estate, leasing sector and rental driven by Ontario and Alberta gains. Public administration observed 12,000 jobs and agriculture observed 9,000 jobs also saw notable gains. The working number in the private sector increased by 96,000 in the month of September while the public sector sum was consistent and the sector of self-employed drops by 35,000. To get more details related to Immigration fill out a Free Evaluation Form or contact us at [email protected] or call us 7207-111-222. One of our experts will meet your expectations and provide answers to queries.